Nope, no ones getting hitched- I’m just pondering the age-old question of what to do with experimental ingredients. Let’s say you’ve bought something entirely new-to-you; do you stretch your culinary muscles with an interesting recipe? Or do you use the newcomer in something tried and true, to lessen its newness and test whether you like it or not? This was on my mind when I opened my fridge today, intent on finally cooking the Brussels sprout tops I bought at the market on Sunday. I’ve been intrigued by these flower-like greens for a few years now; something this pretty must be delicious, right? The fact that they’re basically hats for one of my favourite vegetables is another plus. I originally planned to try something entirely new with these, but once I thought about it, I realised that a simple stir-fry was just the thing to ease me into this new ingredient. Or perhaps I was just being lazy. Obviously, you don’t really need a recipe for this type of dish. Oil, chili, ginger, garlic, soy sauce- I’m sure most of you could make this in your sleep with both arms tied behind your back. But that isn’t really the point; I find it refreshing to occasionally return to something so simple and easy. Plus, a dish like this provides a wonderfully controlled condition in which to test a new veg. With a texture similar to Savoy cabbage and an ever-so-faint flavour of sprouts, sprout tops work wonderfully here. If you can’t get your hands on these greens, you could always just use cabbage (or kale, or chard, or hashed sprouts) here, as it would be delicious with anything. Of course, then this would be a case of something old, something old. Hardly fodder for a self-respecting food blog. 2 green onions, finely chopped. Heat the oil in a non-stick frying pan over medium-high heat. Add the shallot and chili flakes and cook for about 3 minutes, until soft and beginning to brown. Add the sprout tops and cook for 5-7 minutes until greens are wilted and beginning to brown in places. Push to one side of the pan and pour the sesame oil into the cleared space. Add the garlic and ginger and cook in the oil for about 30 seconds, then mix with with the vegetables. Cook everything for one more minute, then add the soy sauce and stir. 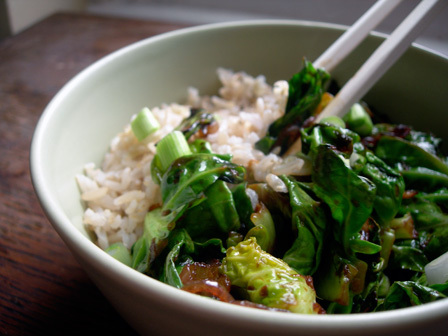 Remove from heat and serve immediately with rice or noodles, garnishing with the green onions. Sounds delicious. I bought some ginseng when I was in Chinatown recently. I’m still not sure what to do with it though. I think some research is required!